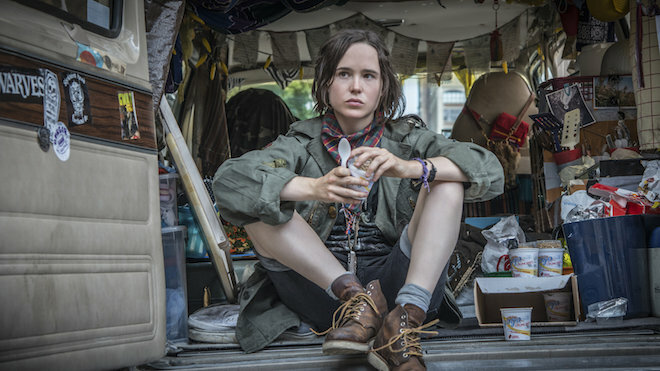 Sian Heder’s Tallulah (2016), one of Netflix’s most recent original films, stars Ellen Page as the eponymous heroine, a young drifter who lives in her van with boyfriend Nico (Evan Jonigkeit). When Nico decides it’s time to go home to see his mother in New York, Tallulah refuses to change her lifestyle. She awakes the next day to discover Nico has left without saying goodbye and follows him to New York City. Tallulah locates Nico’s mother Margo (Allison Janney) at her apartment, but it turns out Nico never arrived there and is nowhere to be seen. Tallulah skulks around a hotel, stealing food from leftover room service plates, and meets Carolyn (Tammy Blanchard), who drunkenly mistakes her for hotel staff, asking her to look after her two-year-old daughter Maddy while she goes out for the evening. As Carolyn gets ready to leave, Maddy wanders around without a nappy on, bottles of alcohol strewed around the room, and low windows left wide open. Tallulah is shocked at Carolyn’s lack of care and bonds with Maddy as she babysits her. When Carolyn returns, completely distraught, and passes out, appalled Tallulah makes the decision to take Maddy with her. She returns to Margo’s apartment and pretends the child is hers and Nico’s, securing a place to stay, financial support and help with the baby. The film is thoughtful and poignant with excellently written characters. It is an exploration of why some women become mothers, of how not all women feel maternal instincts in the same way and of the darker side of motherhood: the mothers that aren’t very capable or the ones who have lost touch with their children. Different kinds of femininity and performing of gender roles are explored through Tallulah, Margo and Carolyn, with each character differing greatly from one another. Tallulah is a vagrant, leading an unconventional life: she doesn’t have a house nor a job, instead she steals and scrounges. She is presented as a free spirit, impulsive and afraid of settling down. However, she develops a strong maternal bond with Maddy, feeling unable to leave the child with her neglectful mother and caring for her lovingly, if shakily. It’s interesting to see a character, otherwise opposed to convention and tradition, becoming so caring. 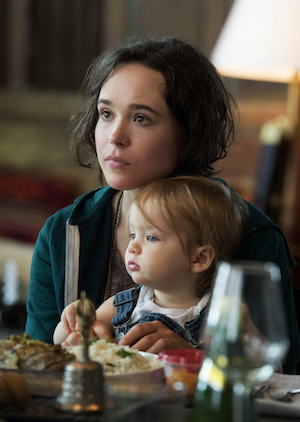 We might expect Tallulah, as a drifter, to feel utter distaste towards motherhood, yet she is shown to be a better carer than the child’s own mother. However, she never loses her core personality, impulsive and eccentric, as when she decides to do some painting with Maddy not on paper, but rather on the various paintings that line the walls and are owned by Margo’s husband. Margo has expressed her dislike of them, so Tallulah sees no problem in painting on them, and even gets Margo to join in, helping her to loosen up a bit. It is important that Tallulah’s personality doesn’t fundamentally change, because not only would this be unbelievable, it would also seem to be implying that she should conform and become traditional in every sense. In a world that often insists on squeezing women into stereotypical boxes, such as either “traditional and maternal” or “unconventional and uninterested in children”, it’s important to see characterisations that combine these assumed contradictions. Margo, on the other hand, has always aspired for a traditional life, saying all she ever wanted was to be a wife and mother. She is a well to-do author and even writes about marriage. Yet hers was a disaster, for she is now separated from her husband, who, after a realisation about his sexuality, lives with his male partner and is waiting for her to sign their divorce papers. It is implied that she knew all along that he was gay and yet continued with the lie of their marriage, saying that she stayed even though he didn’t touch her for the last eight years together. Perhaps she was so terrified of ending her dream of marriage and children that, even when it wasn’t working, she didn’t want to break the façade. To an extent she still keeps up appearances, continuing to live in their marital home, where she has to pretend he does too in order to be allowed to stay there, as he received the apartment thanks to his position as a university professor. The apartment remains as he left it, with his art collection hanging on the walls, haunting her. For all her aspiration to be a perfect mother, she hasn’t seen her son Nico for two years since he basically ran away with Tallulah. She’s kept track of his whereabouts based on his use of her credit card, but has never tried to find him. She must feel hurt at him having left, but also responsible, feeling like a failed mother. Believing that she is a grandmother offers her another chance to reconnect with her son on his eventual return, and a second chance to help raise a child and have a family, unconventional as it may be. Carolyn is perhaps the most interesting of the three, which is a shame considering she has the least screen time. Yet her characterisation may be the most complex: she is staying at the hotel unknown to her husband, with whom she is in a troubled, unhappy marriage. She confesses that she never really wanted to be a mother and feels no maternal instinct. She admits she only had her child as she thought this would make her husband pay her more attention, wanting him to perform the traditional male gender role of caring provider, and perhaps believing the idea that having a family strengthens relationships and means people have to stay together. It seems Carolyn was trying to be a perfect “trophy wife”, desperate only to please her husband, and really disinterested in their daughter and even her own happiness. She bases her worth on male attention and validation: she is desperate for the man she is seeing to want her, and obsesses over whether or not he will find her desirable. All of this is trying to get back at her husband, to make him jealous, regain his interest, and to feel wanted. She returns from the date devastated because the other man wasn’t that interested in her. While Carolyn is neglectful of her daughter, one cannot help but feel sympathy for this woman who sought male validation to the extent that she believed a child would improve her marriage despite not truly wanting one, and is now struggling with the consequences. When she wakes up the next day to find Maddy missing, it wouldn’t have been surprising if she was actually relieved, with her even admitting later in the film that she used to wish that that very thing would happen. However, she is desperate to find her daughter. It took losing her child to acknowledge her love for Maddy, and we can only hope this will lead her to become a more caring and capable mother. These characters easily could have become caricatures, but this is avoided thanks to skilful writing and character development. These women are flawed and complex, having all made mistakes or done morally questionable things, but they also have redeeming qualities and moments (most notably, Tallulah kidnaps a toddler, but only because she believes it’s the right thing to do after she has seen the extent of the Carolyn’s negligence). The lives of these characters are carefully explored, with each woman having a clear emotional transition throughout the film. It is wonderful to see characterisation that really acknowledges that women are complex and varied, with many different aspects to their femininity and identity as women, rather than just narrow archetypes. A woman may be a mother but she is not just a mother. Not all mothers wanted to be mothers, and not all women are good at caring for children. Things don’t always work out for women who want to be wives and mothers. Not all women who enjoy caring for children are traditional and conventional. So often a female character on screen is defined by her gender or by her role as a woman – perhaps as caregiver, parent, wife, or lover – but in Tallulah the characters are multifaceted, complex, contradictory and varied, just like real-life women. All images courtesy of Netflix, all rights reserved. 1. Medium shot of a young white person with dark hair (Ellen Page) sitting cross-legged in the back of a small camper van (with back door open) facing the camera. She’s holding a pot of yoghurt and a plastic spoon and the car is full of household items, as if someone lived there. 2. Medium shot of a young white woman with dark hair (Ellen Page) and a young child with blonde hair and blue eyes on her lap, sitting at a table with some food on, perhaps in a restaurant. They’re both looking off camera to the left. 3. Medium shot of a white woman with long blonde hair (Tammy Blanchard) sitting at a table and smoking a cigarette, looking distressed. There is a man in black suit on the right, we can see his profile, he’s talking to her as if interrogating her. I forgot to add, you can watch Tallulah on Netflix UK!